Debating… auf Deutsch! Fear of public speaking, or glossophobia, is believed to affect 75% of the population. Those who suffer from this fear, including myself, know what it’s like to be faced with a situation in which you must make a speech. It really feels like you’re being thrown in at the deep end. I felt like I was truly flung into Marianas trench when recently I, someone with a massive fear of any form of public speaking, took part in a debating competition… entirely in German. 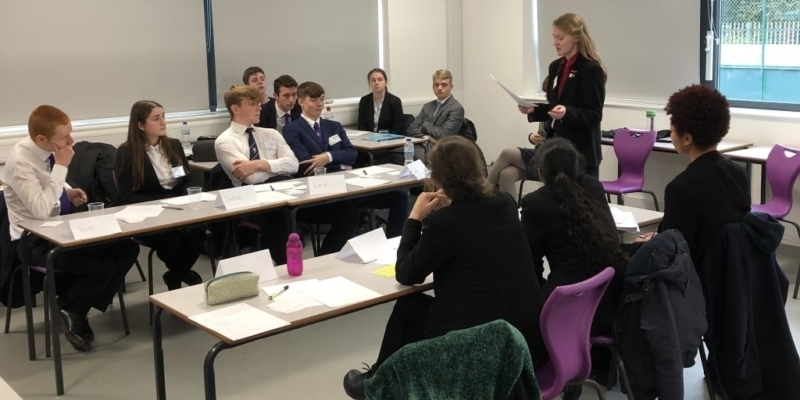 This competition, run by the Goethe Institut, takes place in schools around the UK and the topics, given two weeks before each round, are based on hot topics in our political climate. For example, “Should plastic be banned in Europe?” Whether you agree with the statement provided or not is of no importance, as each team is assigned pro or contra (for or against). In these two weeks of preparation, my German A-Level class of four people and our two extremely enthusiastic teachers worked together to prepare a multitude of arguments and counter-arguments to support our stance. Having no prior experience of debating, I developed a great admiration for the skills required, as two of the girls in my class were keen debaters and helped us incorporate humour and rhetoric into our speeches. For the first round we took part in, I had committed my speech to memory, however I was still incredibly nervous. We had spent every German lesson for the past two weeks coming up with a breadth of arguments and counter-arguments, we had learned dozens of phrases we could incorporate into our speeches, and we had all spent hours learning them. I can’t speak for my fellow classmates, but I spent a large portion of this time absolutely petrified of standing in front of everyone and forgetting everything I had learned and achieved in these last two weeks. After hearing the brilliant argument of our team captain, followed by a very thought-provoking counter-argument by the opposing team, it was finally my turn to speak. I found myself able to express semi-coherent points and rebuttals, and my confidence was fuelled by the pensive expressions of the other team upon hearing my ideas. Knowing that the people listening to you are genuinely interested in what you are saying really inspires you to keep going despite your fears. I managed to recite my speech without any major hitches – the whole ordeal was an adrenaline-fuelled blur, but a success nonetheless. Have I overcome my fear of public speaking? Honestly, no. I don’t believe I ever will – I found the next round equally as terrifying as the first. I am not writing this article to persuade you to take part in such a nerve-racking experience, I am writing this to show that it is possible to do the things you are afraid of and not necessarily overcome them in in the process and that is okay. But it definitely did help, as I proved to myself that I can speak in front of others – after all, exposure is said to be the best cure for a phobia.